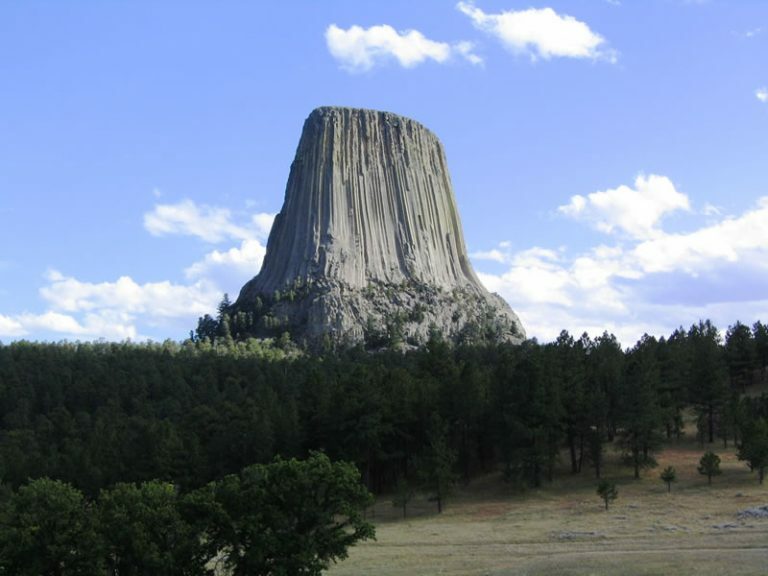 Devils Tower rises majestically 1,267 feet from a pine forest above the Belle Fourche River. President Theodore Roosevelt created Devils Tower National Monument on September 24, 1906. It was the nation's first national monument. A set of red cliffs rise above the Belle Fourche River, which eroded the cliffs to how they look today. Photo taken 09/04/04. Wyoming 110 enters the town of Devils Tower. 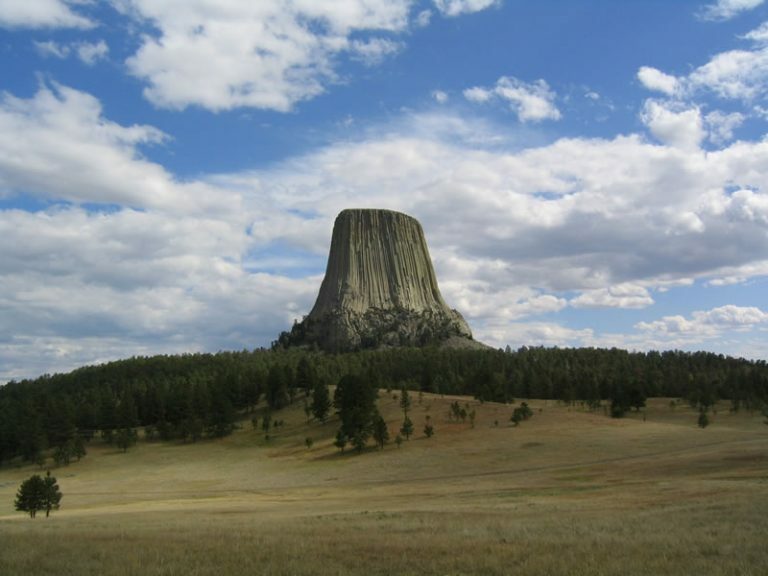 Devils Tower rises to the west, and the entrance station to the national monument lies beyond town. Photo taken 09/04/04. The entrance station for Devils Tower National Monument on WYO 110 west. 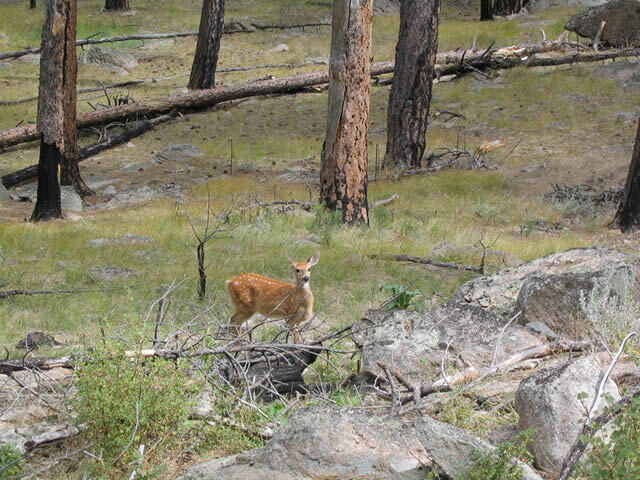 See the National Park Service web site for more information on attractions, park entry fees, hiking trails, etc. Photo taken 09/04/04. Upon entering the national monument, the state highway ends. The entrance road extends to the visitor parking lot. Photo taken 09/04/04. Devils Tower from the visitor parking lot. Several trails radiate around the perimeter of the mountain. Photo taken 09/04/04. Leaving the main parking area at Devils Tower National Park, the park service road winds down toward the Belle Fourche River and passes by several sets of red cliffs. Photo taken 09/04/04. The highway passes over the Belle Fourche River just prior to leaving the national monument and returning to Wyoming 24. Photo taken 09/04/04. Beyond the entrance station for Devils Tower National Monument, Wyoming 110 officially begins and passes through the town of Devils Tower. Photo taken 09/04/04. Approaching WYO 24 on WYO 110. WYO 24 meanders northeast to Hulett and WYO 112. Photo taken 09/04/04. A small guide sign at the east end of WYO 110 references Moorcroft in place of Sundance for WYO 24 south. WYO 24 ends at U.S. 14, which arcs east to I-90 at Sundance and west to U.S. 16 in Moorcroft. Photo taken 09/04/04.